Hi Barbs, I’ve had a very long day – I’ve had so much work to do which meant I had no time to even venture into the garden. Apart from a quick glance at my now thriving new Tomato and basil plants, its been work, work and more work. And now I need to unwind a bit so thought I’d tell you a little about the plant you admired when you were here last week. This unassuming plant is the Scaevola Aussie Salute I bought a few weeks ago. 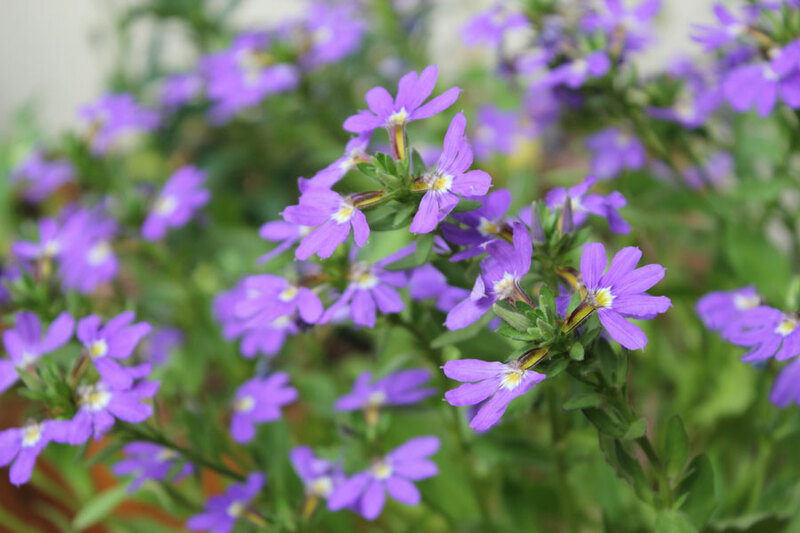 It has been flowering continuously since I bought it, lovely little fan-shaped purple flowers that seem to almost hide the foliage. I’ve read up about it and found out that it’s used a lot in pots, border planting, hanging baskets and as a ground cover. It’s branches grow upright but also spread sideways so its looks very “neat” – like a tidy little bush covered in these sweet purple flowers. The branches are about +/- 4o cm and it will spread to about one metre across (wide) once I plant it out. It apparently flowers continuously from spring through Autumn, is water-wise and can tolerate some drought. It is supposed to do very well in full sun but will also tolerate shade. I’ve had the pot sitting in a spot where it gets full on afternoon sun for a good few hours. Now I need to decide where to plant it – I don’t want to keep it in the pot. Any suggestions? Hi my friend, I have also had a busy weekend and with my Monday chock a block full, my gardening time was limited. I just love that plant. What a strange name it has. I am sure the wonderful suggestions you have received from our readers will be far more intelligent than anything I can offer. it sounds like a very hardy plant and will do pretty well in any spot in your garden. 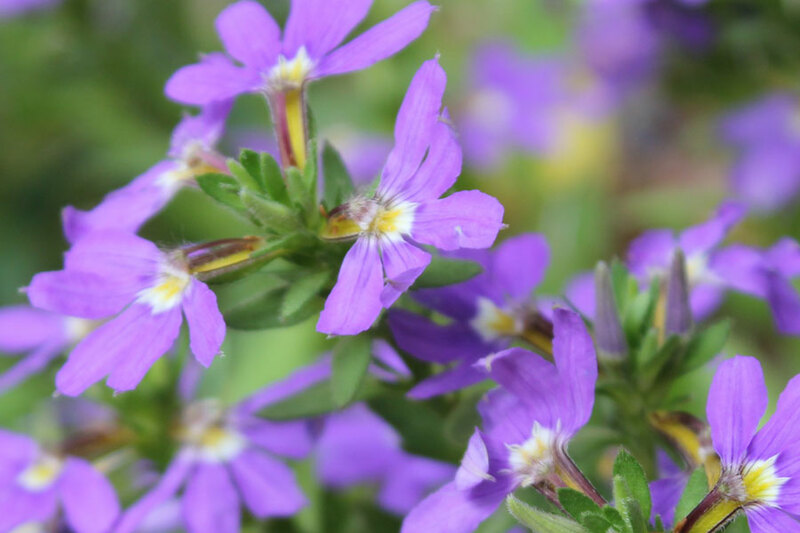 Hello Christine, Scaevola is relatively new to us in the UK. It is used very successfully as a Summer annual, dying off in the Autumn. Great in hanging baskets. I keep saying it again and again, but you gals make me long for spring. Every. Day. i think it prefers sun but i find it’s always worth trying anywhere you think they’ll look good and often they behave unexpectedly. and they probably won’t mind being moved, they’re pretty tough i think. I’ve grown it in a shady spot (under trees) and it did well but I think it would flower better with a bit more sun. So I suppose it’s pretty adaptable. Lovely and cheerful! I love the dialogue between the two gardeners. Wonderful idea of collaborating. Your plant looks so familiar, but the one I am thinking of has a different name. I cannot recall it right now, however. I love the colors.